Make-Up Entrance Exam: Saturday, December 8, 2018 – 8:00 a.m.
Pre-Exam Workshop: Wednesday, November 28, 2018 – 6:30 p.m.-7:30 p.m. The Pre-Exam Workshop is not mandatory. It will take place on Wednesday, November 28, 2018 from 6:30 p.m. to 7:30 p.m. in the large chapel. Students and parents should enter at JCA’s main entrance located along Larkin Ave. It is not mandatory for parents to stay, but there will be a presentation on HSPT scoring, scholarships, and the admissions timeline. Students will then be dismissed to classrooms to take a short practice test. Saturday, December 8, 2018, Joliet Catholic Academy will host its annual Make-Up Entrance Exam for current 8 th grade students considering JCA as their choice for high school next fall. Eighth grade students should arrive no later than 7:50 a.m. and enter through the main entrance off of Larkin Avenue. The exam will begin promptly at 8:00 a.m. Students will exit the building at approximately 11:30 a.m. through the south doors, on Ingalls Avenue. Students are asked to bring the $30 exam fee, two #2 pencils, along with their completed JCA application for admission (students may also drop off or mail in the application before the exam date or fill out the application and payment online). Calculators are not allowed; scratch paper will be provided for the exam. Registration is available online. Please click on the below link to register online. Mail-in and walk-ups registration will also be accepted. *Pre-registration is recommended, but not mandatory. Walk-up registration will be available the day of the exam. Students who have already taken the HSPT at another High School DO NOT need to take the test again at JCA. However, students still must Register Online and send a copy of their HSPT score to the JCA Admissions Office in order to be considered for admission into JCA. Students who do not apply to JCA and do not fill out an online FACTS financial aid profile are ineligible to receive need-based financial aid offers to JCA. Click Here to pre-register online for the JCA Entrance Exam. Click Here to download a PDF copy of the JCA Application for Admission (must be mailed in or dropped off at the Main Office with $30 testing fee). The HSPT consists of 298 questions and ranges from approximately an hour and forty minutes to two and a half hours in duration. All of the questions are in a multiple-choice format. Test scoring measures only correct answers, so guessing is advantageous when the student is not certain of an answer. Students do not have to study for the HSPT, as it gauges previous knowledge. However, there are online practice tests and study guides available. Click Here to take a free online HSPT practice test. For more information, feel free to contact JCA’s Admissions Office at 815-741-0500 or admissions@jca-online.org. More information can also be found at www.jca-online.org. Please note that students who test on the December 1, 2018 date receive priority for admission, top scorer scholarships, and financial aid. Students who test during the make-up exam or schedule an exam at a later date are ineligible for top scorer scholarships, but are still eligible to receive need-based scholarships through the JCA Leveraged Financial Aid program. To learn more about tuition and financial aid options Click Here. 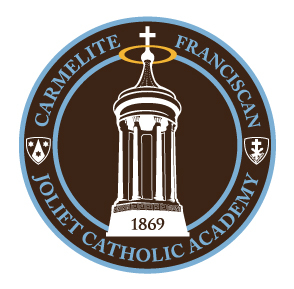 Joliet Catholic Academy is a Catholic co-educational, college preparatory high school co-sponsored by the Franciscans and Carmelites. JCA’s committed, attentive faculty and staff challenge every student to reach their full potential. Joliet Catholic Academy offers a stimulating curriculum and boasts a competitive athletic program while fostering compassion and service to the community and to each other. Our extensive range of extracurricular activities encourages students to live with integrity, grow spiritually, acquire academic excellence, and act responsibly.